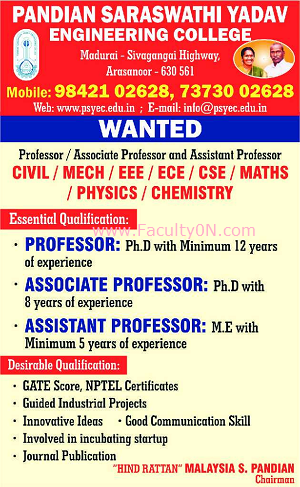 Pandian Saraswathi Yadav Engineering College, Sivagangai has advertised for the recruitment of Teaching Faculty- Professor / Associate Professor / Assistant Professor jobs vacancies. Interested and eligible job aspirants are requested to apply immediately from 19th Sept 2018. Check out further more details below. About College: Pandian Saraswathi Yadav Engineering College was established in September 2000, by “Hind Rattan” Mr. Malaysia S. Pandian with the sole aim of rendering quality technical education to economically weaker and down-trodden students.PSYEC is located predominantly in a rural area on the State Highway (SH-33) connecting Madurai and Thondi.